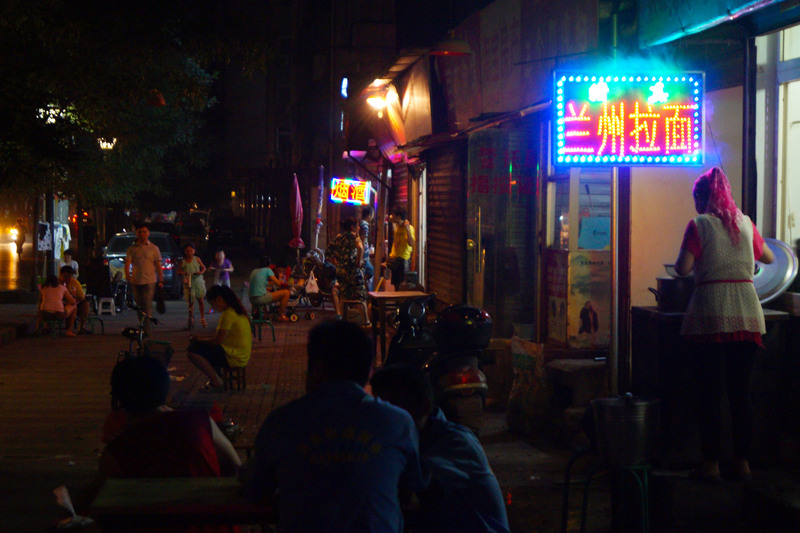 For people like me who grew up in little towns the buzzy streets in China in the evening is like entering another world. Xi’an is by no means a huge city by Chinese standards with its 8 million inhabitants but that is already 3 million more than the entire population of Finland. When I arrived for my first time in China I was amazed at the insane traffic and the amount of people on the streets. The streets would fill up with people already in early morning time and decrease only towards noon when the temperatures reached near unbearable levels. It took me a while to realize that each street was filled with shops and restaurants, something I only knew from shopping streets in Germany and Finland. No matter in which street I went they were lined with hundred of shops next to each other and people all around. But it wasn’t till my first journey during evening hours around the small side streets of Xi’an that it made click and I comprehended that I really arrived in another culture. You see in the little German city I grew up the stores closed latest at 8pm and already before that magical time the streets were abandoned as if they had rolled up the sidewalks. In Finland it was no different except the occasional partygoers at weekends in Helsinki. So what made me comprehend that I arrived in another world? It was already dark and those little side streets were packed with people. Not so much as for trying to still get some late shopping done but to socialize at the restaurants and street kitchens. Everywhere people were sitting outside on plastic stools around small tables filled with food and more often than not countless bottles of beer. The ever-present mouth-watering smell of different foods all around overloading the brain for a decision on what to buy first. In Finland were we lived back then it was near complete silence at evening time. Only the occasional car passing by or some animal sounds but nothing more. I was so used to the quiet of the night that I walked around the streets of Xi’an with utter disbelieve on what I saw and heard. Loud chatter coming from the groups of people clouded around those little tables, some vendors selling melons on the street praising the quality of their goods, silent death scooters cruising around managing somehow not to collide with anyone and of course the awkward tourist here and there. Oh guess what, more food! The city was full during day time and alive but it all paled in comparison to what the city was like during evening hours. It got dark by seven pm and this would mean in my hometown that it is dark except some street lights. But there in Xi’an it wasn’t dark, no it bright everywhere. Colourful signs at each shop and restaurant and nearly all buildings illuminated by lights reminded me on those old Hong-Kong movies I used to watch in my youth. Each small street felt like a treasure to be discovered as each one had their unique feeling and groups of people. Later on my travels to China I would always enjoy going out for a walk around the streets in the evening as it somehow felt special to me. I know that this description of Xi’an fits basically most cities in China or Asia however that city has been the place I spent most of my time in during my holidays in China for the past years. 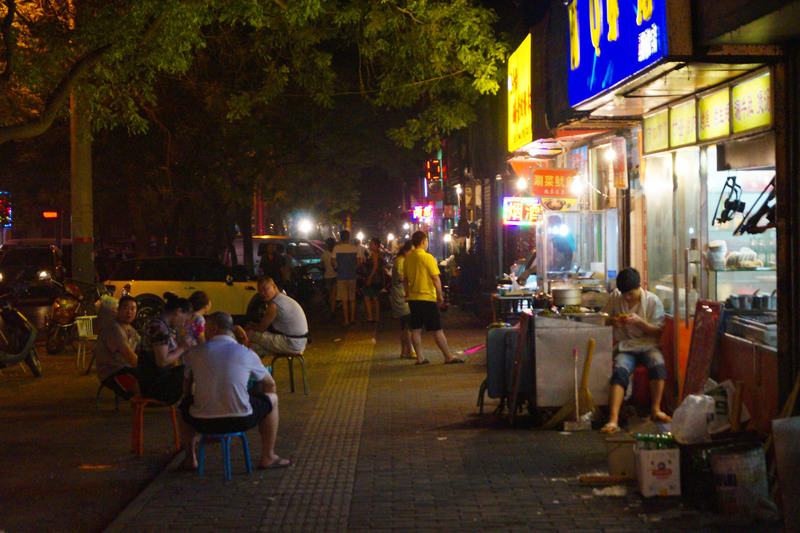 Each time before traveling to China I get excited about the holiday itself but I am especially looking forward to those small evening walks and enjoying the food from the street kitchens. This blog post has been existing already for a couple of years but somehow I never got around posting it. This post is pretty much different than my usual stuff as there is no Nathan, MIL or anything about my crazy family, just my experiences and feelings when thinking about time spent in China and enjoying the time there. What do you connect with Asian cities during evening hours? It sounds like you are used to it by know, Crazy. Isn’t it great to walk out in Xi’an and get food so easily, and do shopping so easily late at night 🙂 When I moved back to Melbourne, I was so shocked to discover that many shops closed at 5pm on weekdays, and some of them didn’t even open on the weekends. In Singapore and Malaysia, night time for me was going out to buy groceries and basically hang out on the streets. However, my parents always warned me because there are so many people, be careful of pickpockets. Well, perfect timing to post this now to get reacquainted before your next big trip to China. I think the most important thing is food. With shops staying open until late night or sometimes remain open for 24 hours, it is easy to get food all the time, and food is a BIG part of our lives. We can get hungry at any time of the day! Some people like comfort and privacy; others prefer companionship, noise and the bright lights. Those of us who travel get to experience both. Through I can handle both I would not know yet how the busy, loud life in China is for me as I never stayed longer than five weeks in a row there. As it’s been always just s holiday so I knew that I would go back to the silent relaxing life after short time. That’s a brilliant comment. I agree–we get the best of both worlds! When I go back to New Zealand I’m going to miss everything being open all the time! I’ve become so used to the convenience of it all. I’m a night person, so I really love the cities here. I love night markets and street side food stalls too, which I miss here. In Kathmandu, there are not that many, but definitely more than here in Poland! I understand you, I really miss this Asian night live,! True haha. They also also big fans of flash naps, with their heads resting on an arm on the table. It’s the same here in pretty boring Haiyang. Shops are always open and the streets are always filled with people and lit up. So interesting to hear about your initial experience with China. Thanks for sharing! That’s what I like so much about Asian cities. It’s like they sleep during daytime only to put their red dress on and party hard at night:) Such a different from the Scandinavian countries. Even Copenhagen is rather dead after sunset.. I like this blog…I lived in China for three years and still miss it – I miss the men walking around with their shirts above their (usually fat) bellies, provincial Chinese men and women selling fruit and vegetables on flat bed trucks in Beijing and Chinese people exercising by walking backwards…so many other things too. Oh yeah those things I even forgot to mention. There are just so many things which are so different from what I am used to.